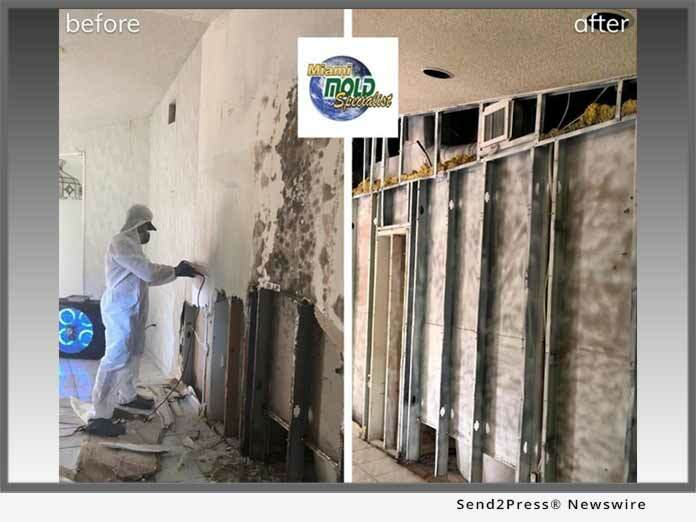 MIAMI, Fla., Oct. 8, 2018 (SEND2PRESS NEWSWIRE) –- South Florida based indoor environmental services and mold removal company, Miami Mold Specialists, releases innovative line of aerosol based mold removal, mold inhibiting, and mold preventative products. 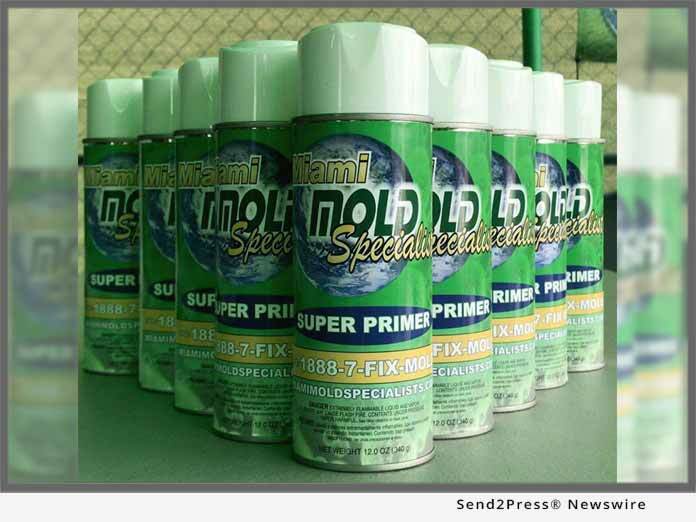 Miami Mold Specialist has released a brand new line of aerosol based mold removal and prevention products. This new product is an aerosol based product that utilizes the latest in bio technological scientific breakthroughs to prevent and combat toxic mold. Miami Mold Specialists proprietary aerosol mold removal and mold prevention products effectively eliminate mold by dissolving mold at its base while simultaneously leaving behind an invisible anti-fungal coating, assisting with future mold and mildew growth prevention. This unique industry disruptive technology is now utilized on all of Miami Mold Specialists projects. It is also available for retail sale for homeowners, home improvement contractors, kitchen and bathroom remodeling companies, general contractors, mold removal and mold remediation companies, water damage restoration companies, and boat, yacht, and ship builders that are in need of a powerful mold removal and mold prevention solution. Miami Mold Specialists new proprietary line of aerosol mold removal and mold prevention solutions use an advanced atomizing delivery system to get into tight spaces and is made with no harmful compounds, VOCs, or poisonous chemicals. Aseptic+ – Multi-purpose, hospital grade disinfectant solution. plus, a wide range of specialized solutions for mold removal, mold prevention, disinfecting, odor removal, static removal, and solar powered attic and soffit fans. For more information about Miami Mold Specialists industry disruptive,proprietary line of aerosol mold removal and prevention products, please visit- https://www.miamimoldspecialists.com/anti-fungal-mold-prevention-spray. South Florida’s Premier Indoor Air Quality, Environmental Services, and Mold Removal Service Provider- Miami Mold Specialist: High Tech and Eco Friendly Indoor Air Quality, Mold Assessments and Environmental Consulting, 3rd Party “Conflict Free” Mold Testing, Mold Removal and Mold Remediation, Mold Prevention, Radon Testing, Water Damage Control, and Water Protection and Purification Services by Miami Mold Specialist. Miami mold removal company, Miami Mold Specialist, shines as go-to source for mold, indoor air quality, and other related indoor environmental services. Specializing in high tech mold inspections, 3rd Party “conflict free” mold testing, and rapid mold removal services. Offering rapid response, eco-friendly mold remediation services, and a 1 year warranty.